Turkish gymnasts are all pumped after one of them competed in the Olympics for the first time in the country's history three years ago. Training for quota competitions for the upcoming Tokyo 2020 Olympics, they seek individual medals but believe a team win would be a major boost for sports that have gained more prominence in the country in recent years thanks to gymnasts' accomplishments. Ümit Şamiloğlu, who boasts six medals in the men's horizontal bar in international competitions from the Mediterranean Games to the Challenge Cup Artistic Gymnastics where he had a streak of top titles for two years, devotes his days to intense training in a training hall in the capital Ankara for Tokyo 2020. He says they want to be in Tokyo "as a team" rather than individually competing, saying a team competition would be a first for Turkey in the Olympics. Ferhat Ar›can shows off his bronze medal in Artistic Gymnastics Individual Apparatus World Cup in Doha, Qatar, March 24, 2018. To achieve this, they have contests ahead which serve as qualifiers for the 2020 Olympics. "Now, I am training for the second leg of an eight-leg World Cup. A top title automatically qualifies you for the Olympics. We have some four or five gymnasts who can accomplish this, and we will seek to garner enough points by the end of the year. Of course, every one of us would want to secure a spot in the Olympics, but the main goal is to be there as a team," Şamiloğlu told Anadolu Agency (AA). The Turkish gymnastics team was fifth in Europe standings last year and rose to 15th place in global standings. Teams in the top 12 in the upcoming World Championship, which will be hosted by Germany, will qualify for the Olympics. "We are concentrated on this. We have never been in the Olympics as team but now, we have a chance and we want to win as many medals as we can," he says. Ferhat Arıcan was the first Turkish gymnast to compete in the Olympics when he qualified for Rio 2016, though he returned empty-handed. 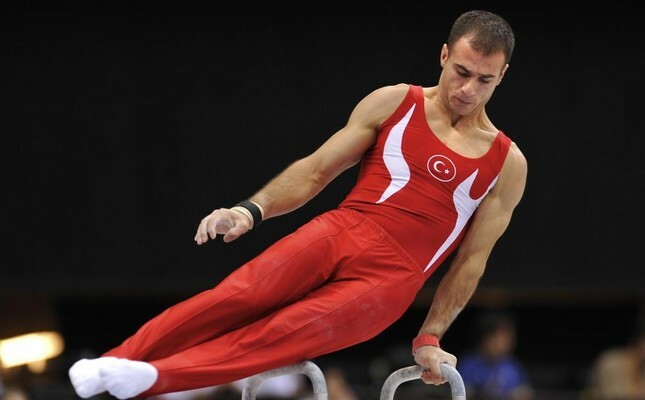 A few weeks into the second leg of the World Cup in Australia, Arıcan, a 12-time champion in top-flight competitions in Turkey, continued to polish his skills on the pommel horse in training sessions in Ankara, like Şamiloğlu. "We have a great team spirit here, and I believe there is more we can do," Arıcan told AA. "We have a great generation of gymnasts today. I was depressed when I had to compete in Rio alone. If only we could compete in Tokyo as a team. It would deliver the accomplishments Turkey longs for," Arıcan says. "I am confident that I will win a medal in the Olympics," Arıcan, who is currently ranked third in the global standings for gymnasts. Suat Çelen, head of the Turkish Gymnastics Federation, has confidence in the athletes and says he expects "every one of the boys to compete in the finals" of each competition. "We were in 43th place in global standings four years ago and now we stand in 15th place."